The reason behind great boleto conversion rates is not always straight forward. I have seen cases of online stores within the exact same industry, offering very similar products and prices with extremely divergent boleto conversion rates. Recently, I analyzed the case of two EBANX merchants operating within the perfume & cosmetics industry, one selling to Brazil from Europe while the other ships from Asia well-known western brands like Dior and Lancôme. Our European merchant boleto conversion rates averaged 60% in 2016, while our Asian merchant’s boleto conversion averaged 40% in that same period. 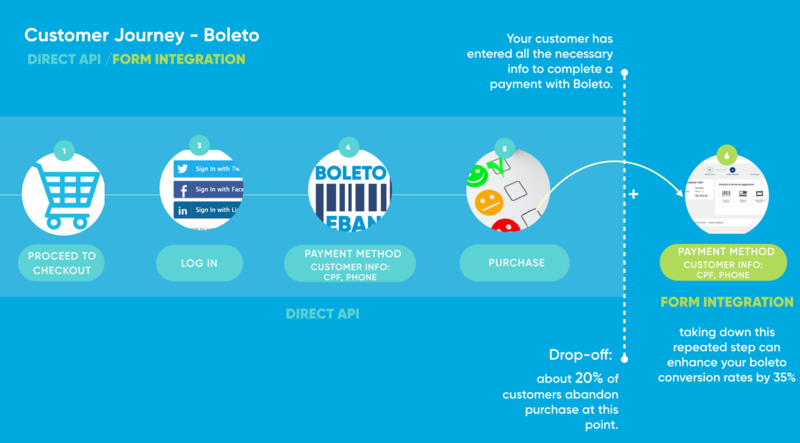 A customer’s trust on your online store has a significant effect on your boleto conversion rates. Brazilians hold European stores in high regard, they feel comfortable purchasing from European stores, it’s even a kind of luxury, while Asia is far and mysterious in the minds of Brazilians. Optimize for trust to increase sales conversion rates. Trust is the cornerstone to long distance relationships, right? However, there is a less obvious aspect about boleto conversion rates that I want to share with you. This week I also concluded a 10-month long research on which I A/B tested the boleto conversion rates of two different integration methods: direct API integration and checkout integration, that is the integration where your customer is redirected to an EBANX hosted environment to conclude the payment. Direct Integration boleto conversion rates averaged 60%, performing 35% higher than the third-party hosted integration. Third-party hosted checkout’s conversion rate was ˜25%. The average ticket of this merchant is USD 50, meaning that for every 100 boleto transactions processed through the third-party hosted integration, only 25 were converted, 35 could’ve been converted if processed through direct API but were lost, equivalent to a USD 1750 profit lost. * * This analysis was carried out with the consent of our merchant, who received a monthly performance report and analysis. The average conversion rate for boletos processed through Direct API on the same period was 59.5% while the conversion rate for boletos processed through checkout integration it was a scant 24.55%, an average difference of 35% for the entire period. There is a strong inverse correlation between boleto’s of high values and conversion rates. Redirecting your customer from your website to a third-party hosted environment can cause you a 20% drop-off rate. Here at EBANX we pay attention to detail to make sure our merchants can get the most out of our services and succeed in the Latin American market. Check out another case study of a merchant who increased their sales by 114% by offering installments in Brazil.